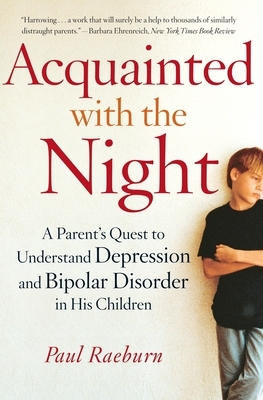 In the tradition of Kay Redfield Jamison’s An Unquiet Mind, Acquainted with the Night is a powerful memoir of one man’s struggle to deal with the adolescent depression and bipolar disorder of his son and his daughter. Seven years ago Paul Raeburn’s son, Alex, eleven, was admitted to a psychiatric hospital after leaving his fifth-grade classroom in an inexplicable rage. He was hospitalized three times over the next three years until he was finally diagnosed by a psychiatrist as someone exhibiting a clear-cut case of bipolar disorder. This ended a painful period of misdiagnosis and inappropriate drug therapy. Then Raeburn’s younger daughter, Alicia, twelve, was diagnosed as suffering from depression after episodes of self-mutilation and suicidal thoughts. She too was repeatedly admitted to psychiatric hospitals. All during this terrible, painful time, Raeburn’s marriage was disintegrating, and he had to ask what he and his wife might have done, unwittingly, to contribute to their children’s mental illness. And so, literally to save his children’s lives, he used all the resources available to him as a science reporter and writer to educate himself on their diseases and the various drugs and therapies available to help them return from a land of inner torment. In Paul Raeburn’s skilled hands, this memoir of a family stricken with the pain of depression and mania becomes a cathartic story that any reader can share, even as parents unlucky enough to be in a similar position will find it of immeasurable practical value in their own struggles with the child psychiatry establishment. PAUL RAEBURN was formerly a senior writer and editor at Business Week, where he covered science and medicine for seven years. He is the recipient of many distinguished writing awards and is also the author of Mars: Uncovering the Secrets of the Red Planet and The Last Harvest: The Genetic Gamble That Threatens to Destroy American Agriculture. A native of Detroit, Raeburn lives in New York City with his wife, the writer Elizabeth Devita.